In a time when most businesses are getting hit hard by the economy, a few still believe in the goodness of the human spirit, and are testing out a pay-what-you-want concept to give back to charity. 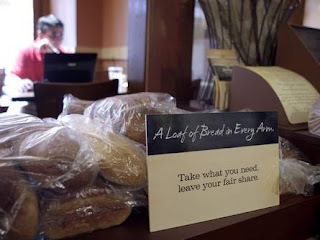 Panera Bread, loved for their delicious and fresh café food, is testing out a menu with no prices but simply a sign that states: "Take what you need, leave your fair share." Their Clayton, Missouri restaurant has been turned into a non-profit community kitchen, run by Panera's charitable foundation. Cashiers and bakers still work in the restaurant, but diners are encouraged to give the price they'd like as a donation. The Clayton store has already been recognized for giving money and leftover food to the local needy, but this experiment in pay-what-you-can dining has encouraged many diners to give even more than the normal price of the meal. Two more cafés will be opening soon to continue the experiment. Next time you go out for a meal, try to find one of these charitable restaurants in your local neighborhood. Food tastes even better when there is a good feeling behind it.